With so much data available now, what are we to do do? School leaders are always faced with a daunting task of predicting the future and making judgements on how to improve their school. In an ever changing and increasingly complex world, more leaders are examining data to make more reflective decisions and increase their accountability in schools (Earl and Fullan, 2003). Fortunately, we now have the tools to gather information in a digital context. At the end of the day, the data that we collect, analyze and use to make decisions to improve the overall learning for students and our schools. Watch the elevator pitch (This will give you more ideas on your own elevator pitch) on radian6. With so many different outlets for students to voice their opinions, how can we keep track of all their conversations? Do you think radian6 will have a place in the educational market? Big data refers to the complex and large amounts of data available to educators. How can we make meaning of this information? Can we actually learn more about our student’s behaviour online through radian6 and link what they’re interested in the classroom? Click on one of the options or input your own. If you want to extend your thinking, look at what this school at how they’re using data – changing their instructional practices to allow students learn Science through rap. Click here! With so much raw data that we collect every day at school, reading and writing assessment, rubrics, attendance etc. How do we sort all of this information into meaning in an online context? Look at these statistics collected by Google Analytics in the past month from our ‘ETEC 522 New Ventures in Technology’ website. 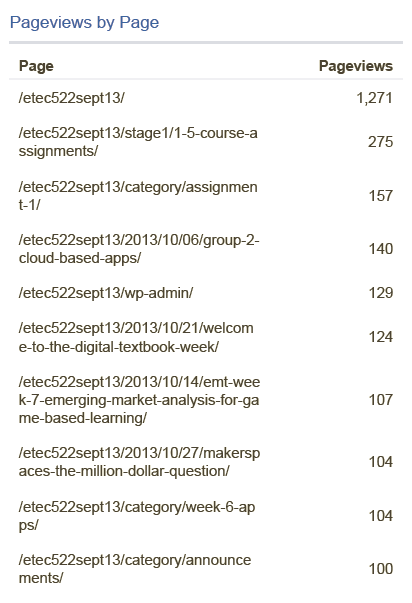 This provides us with interesting insights on how we engage with our own course website. 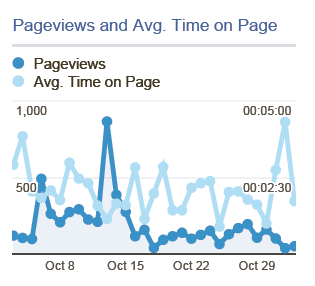 As you can see, it shows specific information on the Pages views and Average Time on Page, There was a spike between the period of October 10 to 14, around the time when our Opportunity Ventures assignment was due. Interestingly, our average time on each page was not as high. What does that mean? Did we only submit our works before leaving the page? Did we upload comments on each other’s work? Pagesviews by Page indicates what we are visiting the most, we usually log in to the main page of the website first, with 1, 271 hits from October 3 to November 2, 2013. Most likely because we bookmarked this page, or we view this page the most to view more specific pages. The second most hits is looking through our Assignments, with 275 page views. This is most likely to find out whether we have assignments due soon. 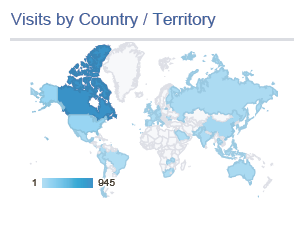 Thirdly, visits by country shows us where our website is accessed the most. Obviously most students taking this course is from Canada, but notice some countries from Africa, and South America also go into this website – Are there students in our program from these countries – or are there other visitors that are interested in what we do? Now, you will get a chance to become a data analyst! You will sort large amounts of data and make some meaningful insights through Google Analytics. With your Gmail account, write me a quick email at rockytlam@gmail.com so I could give you permission to view the data for this website. Simply log into Google Analytics first and access Learning Analytics 2013 with the tracking code of UA-45401011-1. Once you’re there, you will see a lot of options on the left side labelled “My Stuff”. Under Dashboard, you can create a New Dashboard, with the option of Starter Dashboard – you will be able to view most of the basic information about our website. You can also manually view the data in Real-Time as well as different Standard Reports. Please be patient as this website is new and not as much data will be available as compared to our ETEC 522 main website. Also, I will need to grant permission for each Gmail account that you provide. Once finished, you can make a comment below on how you could use Google Analytics and apply it to your school or classroom website and blog. What specific information or suggestions can you guide students in their learning process? If students are always visiting the Games section in your blog, should we improve in expanding that section to make learning more relevant for students? Should we instead focus on making other sections of the blog more interesting? Post away! The issue of ethics and privacy comes into play when data mining social media of our students. Data mining of student data should be restricted to school performance data and school questionnaires with data kept confidential. That’s such a good point! Now that you mention it, Radian6 never really addresses the point of privacy, but data just magically appears! Educational data mining is such an interesting topic, and it’s long been under discussion in Canada – the first International Conference on Educational Data Mining was held in Canada 5 years ago, and the primary editor of the Journal of Educational Data Mining (JEDM) is at a Canadian institution. There has been much concern and debate about Google Analytics – There are browser plugins that you may install to reject tracking cookies, for example, but many browsers come with this feature already built in in order to comply with various global laws. Of course, there are also stories of savvy webmasters who circumnavegate those laws, as well as the horror stories of school-issued computers that will track and record everything, even incorporating the built-in webcam, without student knowledge. That being said, I’m wondering how you back up your “should” comment, @davej? Is it a moral or ethical assumption, and how does the statement correspond to the efficient use affordances enabled by data? -Would you make a distinction between computer use within the school (ie, a computer lab) where it may arguably be the school’s right to know how the students are using the computers, while in the lab, or usage of school wifi on personal devices, where it could be seen as more of a delicate issue (BYOD) but still utilizing school-funded broadband? -Would you make a distinction for data mining if the topic under study was bullying or harassment between students, used in prediction of if and when an intervention is required? It is not my opinion that there need to be strict rules that apply to data mining conducted with common sense and consideration of a person’s right to privacy.These considerations may fluctuate subject to the need to know for the benefit of the school community. My point has been that we should not be dragging through student data without a defined purpose only to see if something comes up. If we allow “snooping” in education, we are setting our kids up to accept this as the norm, preparing them as perfect citizens for a surveillance society afraid to go out on a limb with their opinions. In other words afraid to voice dissent, the essence of democracy. ‘Lest we forget”, our most sacred duty as educators in the public school system, again in my opinion, is to preserve and strengthen our democratic institutions. Dave, my previous post wasn’t meant to put words into your mouth, I was just wondering at your use of the word “should” and wanting to expand the discussion because I find it very interesting. Also note that I wasn’t suggesting a dystopian future of snooping as a norm, merely wondering what your (and our colleagues!) opinions on the uses of data analysis as it occurs within the usage of institutional provisions, like wifi access or computer access. You mention that data mining should be conducted with common sense provisions, but an anthropological standpoint would contend that there is no stable construct of common sense, and that this term is relative as it is applied by different user groups. So yes, defined purposes are important, such is the reasoning behind, say, a search warrant. Of course institutional privacy is important, and data should be guarded against misuse. However, what happens in the case of data that comes up indicating a problem that diverges the path of the defined purpose? As you mention, education may be seen as an inherently political activity, with educational ideals as both a goal and a method. So, who should grant the rights of data collection – a school principal, a district superintendent, a provincial or federal minister of education? Students, parents? I really like to idea of having all the data in one place and having the capability of viewing it in easy formats, such as graphs. I know this type of data collection tool would be very beneficial for the students as well as for myself, in order to connect all our medias together, such as email, FB and Twitter, without me having to check all of these sources independently. I’ve been keeping an eye on the Google Analytics page for a few days now, and it’s interesting to see how the numbers change. At the time of this writing, the average page view is 13.38 minutes, down from Monday when it was over 15 minutes. This is an extraordinarily long time as compared to the typical length of a website visit, so perhaps visitors are as captivated with the topic as I am and really taking the time to let information sink in. There are a few caveats to analyzing the time spent on page, however. For example, on one hand, if a user closes their web browser, the last visit is not counted (time on page only records between page clicks). That being said, there is also a metric for average number of pages visited, so these could be relatively compared. Right now, that average is at 7, however because what I assume was the team’s final checks before going live, this number may be skewed due to an outlier on Sunday (66 pages/hour at noon). It would be helpful if outliers like this could be removed from the equation. Haha you’re probably right, I wanted to make sure the program was working before the start up – I am not sure if you could remove data on the program. I especially like how you could see which servers accessed the website – and the program of choice that people use to view the website – Chrome is winning! It is so clear to see how analytics could support business with tools such as Radian6. I was in a newspaper article about using an augmented communication app with a student and was contacted the next day by the company to ask if I needed any support and to thank me for using their product. As the article was available digitally as well, they were clearly using a similar product to track, analyze and respond to customers that were using their product or talking about it online. It was powerful to have a company reach out to contact me directly and my attitude towards the company and product improved as a result. I’m interested to see how educators will use LA data in the future. Will it be possible to combine LA data collected from multiple learning platforms to provide a greater understanding of student progress? How will parents react to this type of data? Will this data become more valued than teachers observations? Or will LA data compliment feedback from teachers to provide a rich description of where a student is at and where further support is required? I tend to be optimistic and therefore believe that educators will be able to take advantage of these tools to compliment and improve their practice over time. As you noted the relativity of common sense indeed leaves wiggle room. This is why guidelines can help teachers, but there will always be issues with guidelines. The reason the police need warrants in spite of the law is to protect the public from the miss-use of police power while still offering the possibility of regulatory override. Common sense is generally available at the School Based Team level. It seems to me a fool’s errand to get into defining common sense. It is merely an appeal as a caution not to infringe a person’s rights to privacy. It is my belief there should be no expectation of privacy with anything online. The age of public anonymity is over be it in the physical or digital world. As educators in such a reality we should be encouraging our students to act accordingly. Data mining is a powerful tool and here to stay. So too, is the “surveillance society” society you describe in a later comment. The best we can do as educators is to encourage students to moderate their comments, teach them the technical know how to protect themselves and inform them about what laws and technologies make this possible. However, with rising populations rates (predominantly) in parts of the world where societies can’t afford to educate their citizens to globally competitive levels I think we should use educational data mining to allocate resources most effectively. I think privacy is largely a luxury of the rich; people without basic necessities have more pressing concerns. Will this be abused? Almost surely for profit if nothing else but it also offers immense potential when thought of timeline of several generations. I don’t expect everyone to agree with me and I respect your point of view. It makes this discussion more interesting! My view is that we as educators have a duty to our students’ privacy, especially due to our privileged access to our students. This trust puts us in a different category to Google, Facebook, Twitter etc. We should not exploit and take advantage this privileged access. I really enjoyed the activity. It was something completely new for me and I think it is really interesting how easily you can access a variety of information. I am sure that this has a place somewhere, but I fail to see any use for it in my current educational context. I think if you are looking at education where kids don’t have a choice, they need to complete most of the assignments we give. Although there might be tidbits of information we can extract and use to guide future projects, I cannot see any major changes resulting from these types of analyses. Maybe I just don’t see it yet, but again really neat activity. I am really enjoying reading this debate as it progresses. It is interesting because I agree with both sides. Yes, we need to be concerned with student’s accepting a lack of privacy as the norm. There are already so many heartbreaking stories of students getting in trouble after putting too much personal information online. I can see the point that engendering that sort of an environment through widespread adaption of learning analytics can be extremely dangerous. However, on the other hand, I am excited by the possibilities that learning analytics afford. To be able to see where students spend their time while working on school projects is valuable information, to predict their interests and incorporate that into lessons or even to be able to suggest further resources. These analytics provide information that could be integrated into more intrinsically motivated study. So where does that put me on the stage of acceptance? I like what Nicola asked about computer labs. If these analytics are implemented solely in school then it becomes another facet of this public environment. The same could be said for analytics applied to school websites. They would collect information to improve a service. Much like technologically assisted teacher observations. I would be much less worried about them being implemented in this way. Tools are what we make of it. How we teach it to our students will make all the difference. Also, like you said, I think we would just get desensitised eventually if we were filmed. I remember hearing a story that the parents would watch the teacher teach in the classroom as well through a live feed. Learning analytics sounds like there is so much potential to really meet the individualized needs of every student. With the data that is gathered, programs could be created to give students feedback at every step of the learning process so that they understand what went wrong. It would allow us to engage students, and allow them to delve deeper into topics of interest, and enrich for those students who need it. There is also the potential for remediation for students struggling. Offering more practice with concepts that they find harder, and thus enabling them to be successful in a program. Teachers use this type of data every day to the best of their ability, but the amount of data makes it impossible to do something with every piece. On the flip side, there is also the privacy issues. With the Freedom of Information and Privacy Act, this type of student data that is linked to a potential student cannot be accessed by someone without the proper authority. So it becomes an issue of who has access to this data. If it is an outside source that is compiling the information and submitting it to the schools, than that would not be in line with the Act. However, if it is standalone software, than would that bypass outsiders seeing the data, much like Markbook is used to enter the marks, but comes from an outside source? As I was submitting Team5’s work into the NMC Horizon Navigator today, I realized that it too is a form of analytics – you may login and use a variety of the tools for free, but for an annual subscription you receive a variety of analytic tools at your disposal. It’s very interesting in the context of the present debate over privacy and security of our students, that we, as students, are required to submit our work into this analytic device to support a paid data-mining service. @dave, in terms of students being required to complete the assignments we give them, the power of analytics lies within the usage of the tools we provide our students in order to complete those assignments. As Amber has mentioned, the data can illuminate the usage of the pedagogical tools we provide. Are students merely clicking through webpages and not actually reading them? Which links are they clicking? What sort of content drives interest? Analytics can not definitively answer all of these questions, but it can provide an analogy of neoroimagining that is, at this point, external. The broader question of these analytics lies within the future of technological convergence, which is where the very important privacy and ethics concerns of @davej come into play, in the present, in order to set precedence.